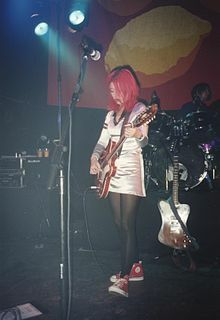 Miki Eleonora Berenyi (born 18 March 1967) is an English singer, songwriter and guitarist best known as a member of the alternative rock band Lush and currently a member of Piroshka. Berenyi was born in Chelsea, London to a Japanese mother, the actress Yasuko Nagazumi, who played minor roles in the James Bond movie You Only Live Twice and the TV series Space: 1999 and Hungarian father, Ivan Berenyi. At the age of 14, Berenyi met friend and future bandmate Emma Anderson while both were students at Queen's College. They became interested in music and together published a music fanzine, Alphabet Soup (which lasted for five issues). Berenyi first played bass with the band the Bugs. In 1987, Berenyi studied English literature at North London Polytechnic, where she met drummer Chris Acland and singer Meriel Barham. Along with Anderson, they decided to form their own band, originally called the Baby Machines. Bassist Steve Rippon joined, and they changed their name to Lush. When Barham left, "the remaining members of Lush placed ads in local papers looking for Barham's replacement, but they couldn't find the singer they wanted and Berenyi took over the vocals". From 1987 until 1996, she played with Lush, releasing several albums, singles and music videos and toured extensively through the UK, North America, Japan, Australia and other countries. 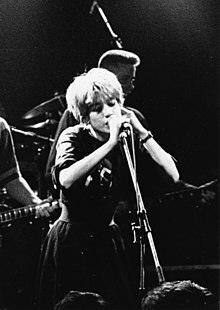 She and Acland also collaborated with members of Cocteau Twins and Moose, releasing one song in 1991 under the name Lillies. Lush officially announced their breakup in February 1998, following Acland's suicide in October 1996. After Lush split, Berenyi appeared on the Rentals' album Seven More Minutes (1999). She also contributed vocals to a remix of a Flat 7 track by Robin Guthrie (who also produced Lush's early work), and appeared on Seinking Ships' debut album, Museum Quality Capture, released in 2010. When asked if she missed anything about her time in Lush, Berenyi stated, "I miss the excitement and energy of playing live and the camaraderie of touring—being with the band and crew in a foreign country is like going on holiday with your mates but even more fun because it’s free." She also said, "I enjoyed being in the band immensely, I’m glad I did it". Berenyi later worked for a magazine as a sub-editor and did not perform for many years. She explained: "I was never a proper guitarist—only in the context of Lush. I played the guitar to write songs on and to play live". Lush, including Berenyi, announced a reunion on 28 September 2015. They toured extensively throughout 2016 and released an EP of new material; "Blind Spot" in April of that year. Bassist Phil King left the band in October 2016 and as a consequence Lush played their final farewell gig, with Michael Conroy of Modern English on bass at Manchester Academy on 25 November 2016. In September 2018, Berenyi announced that she had formed a new band, Piroshka, with Welch, Conroy and former Moose member K.J. "Moose" McKillop. Berenyi and partner McKillop have two children. Their debut album, Brickbat, was released by Bella Union on 15 February 2019. ^ "Artist Biography". AllMusic. AllMusic. Retrieved 16 March 2018. ^ Erlewine, Stephen. "Artist Biography". AllMusic. AllMusic. Retrieved 16 March 2018. ^ "LUSH Remembered - Discography". Lightfromadeadstar.org. Retrieved 12 August 2014. ^ "lush interview from go (loooong)". Eyesore.no. 18 May 1996. Retrieved 12 August 2014. ^ a b c d e "LUSH Remembered - Biographies". Lightfromadeadstar.org. Retrieved 12 August 2014. ^ "LUSH Remembered - Miki's Reminiscences". Lightfromadeadstar.org. Retrieved 12 August 2014. ^ "Lush - 'Record Collector' Article". Curve.demon.co.uk. Retrieved 12 August 2014. ^ Bonner, Michael (October 1991). "Lillies". Lime Lizard. London: Lime Lizard Ltd. ISSN 0961-8104. OCLC 500000024. ^ Deville, Chris (24 April 2014). "Stars Of Britpop: Where Are They Now?". Stereogum.com. Stereogum. Retrieved 16 March 2018. ^ Dan, Jen (30 August 2010). "Interview with Seinking Ships". Adequacy.net. Delusions of Adequacy. Retrieved 16 March 2018. ^ a b "The VPME | "Sweetness And Light"- The Miki Berenyi Interview 2008". Vonpipmusicalexpress.wordpress.com. 25 January 2008. Retrieved 12 August 2014. ^ "The VPME | Old Favourites-Lush". Vonpipmusicalexpress.wordpress.com. 31 July 2007. Retrieved 12 August 2014. ^ Lorraine Carpenter (1 October 2007). "Miki Berenyi: Lush's Former Singer Reminisces on Britpop". UnderTheRadarMag.com. Retrieved 7 March 2014. ^ "Lush". www.facebook.com. Retrieved 26 March 2019. ^ "We've been away for ages and ages, but we're really excited..." Facebook.com. ^ "Lush". Facebook.com. Retrieved 26 March 2019. ^ "members of Lush, Elastica, Moose, and Modern English form new band Piroshka". BrooklynVegan.com. Retrieved 26 March 2019. ^ Aston, Martin (2013). Facing the Wrong Way: The Story of 4AD. The Friday Project. ^ "Piroskhka - "Everlastingly Yours"". Stereogum.com. 6 November 2018. Retrieved 26 March 2019.